Sushi conveyor belts are very popular not only in Japan, but recently in Europe and the United States. Commonly known as Sushi Go Round or Sushi Trains, these conveyor belts are very popular in sushi fast-food joints. As the name suggests, sushi is placed on a rotating conveyor belt and it goes around the restaurant, passing by every table or person at the bar. This way, the customers can easily pick up what they want and at the end of the meal, they simple put their stack plates into a receptacle or at the table. The modern conveyor belts comes with a touch screen monitor embedded in every table, where the customers can easily order the desired type of sushi with only the touch of a finger. 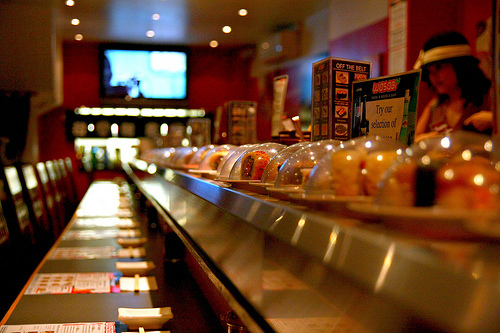 These modern conveyor belt sushi restaurants are particularly popular in Europe and Australia. The sushi conveyor belts are not only very practical and time-effective (both for the customers and for the chefs), but they are very entertaining as well. As a matter of fact, some of the restaurants serve sushi under the form of wooden boats or miniature locomotive cars, just to make them even more appealing to the client. Also mini-games can be played on the touch-screen after consuming a certain number of plates for a chance to win a free meal or drink. In spite of being referred to as “sushi conveyor belts”, these fast food conveyor belts typically transport a variety of other foods as well, from rice and coverings to different side dishes, ginger, pickles, fish and crab meat, vegetables, caviar and so on. They are some downsides to the sushi conveyor belt and that is you will you never have an interaction with a server. Also, many have said that it is gimmicky but that doesnt stop the growing popularity in the United States. This type of sushi serving was invented decades ago by Yoshiaki Shiraishi, who found it difficult to manage his restaurant and to serve the food to his customer all by himself, so he had to come up with a convenient and time-effective option to keep all his customers satisfied and to reduce the waiting time as well. It took Yoshiaki Shiraishi no less than five years to come up with a good and practical sushi conveyor belt design and when he did, he firstly implemented it in his own restaurant and then opened a special conveyor belt restaurant toward the end of the 1950s. The restaurant became very popular shortly after it was opened, and several decades after that there were hundreds of conveyor belt sushi restaurants opened all over Japan. Conveyor belt sushi has become one of the most inexpensive ways to serve sushi. One of the factors that made this sushi serving style so popular in the United States and Europe (in addition to being very practical) is the fact that it requires no Japanese language skills whatsoever and everybody can simply pick up the desired dish, quickly and without the hassles. Conveyor belt sushi restaurants can be found all over the United States of America, from Los Angeles, San Francisco and Dallas to Chicago, Seattle and New York City. Some of the largest Sushi franchises have started to expand their business horizons in the US as well, and one of the latest examples is the London-Based YO!Sushi restaurant that recently opened its first locations in Washington DC, and plans to open several more in the near future. The island nation of Japan consumes more seaweed (both in quantity and variety) than anyone else.